AOBFS YEARBOOK PROMO VIDEO from Aidan O'Brien on Vimeo. John Mr Magnier and Sheikh Mohammed bin Rashid al-Maktoum are owners of the nearby Coolmore and Darley horse studs, two of Australia’s biggest thoroughbred businesses. It means Anglo will have to close its existing Drayton mine in the state. 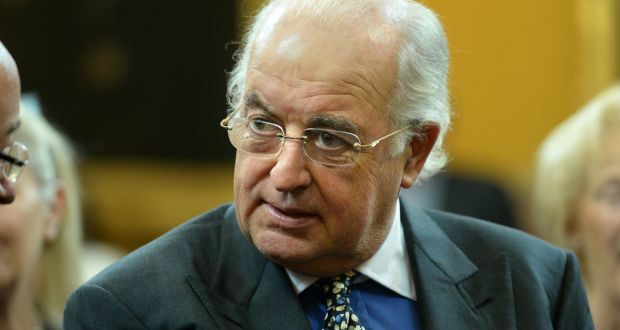 Anglo American has lost its battle with Irish billionaire John Magnier and Dubai’s ruler over the firm’s attempts to expand an Australian coal mine near their stud farms. It means Anglo will have to close its existing Drayton mine in the state. “The mining and thoroughbred land uses are vastly different and are not compatible in close proximity,” said the review, which warned of catastrophic consequences for the bloodstock industry if the studs chose to relocate abroad. However, the commission stressed it had no ideological objection to coal mines noting it was simultaneously granting an extension of a coal mine operated by Rio Tinto in the region. The move is regarded, however, as a reflection of growing community concern about pollution and global warming in the world’s second biggest coal exporter. It is also a poignant symbol of the troubles facing an industry battling slumping prices, weak demand and calls for a moratorium on new mines to tackle global warming. 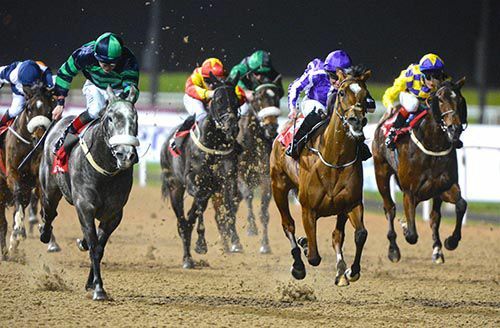 Jockey Seamie Heffernan completed a double at Dundalk this evening, winning the Big Bad Bob Fillies Maiden on his employer Aidan O'Brien's Facade. Facade had finished second at Listed level on her previous start at the venue in October and went one place better today, staying on well for a comfortable two lengths win over Eagle Valley. Heffernan, who also won the opener on Tithonus, later commented "she's a Galileo with a lot of ability. She'd a very good run the last day and was entitled to win. She has a big engine but has had little niggly problems." 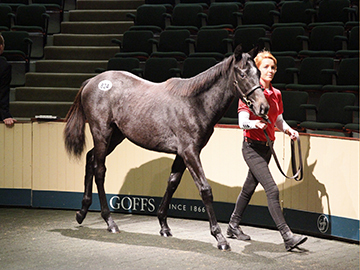 ON A day when six-figure transactions became somewhat more commonplace than they had earlier in the week, a €150,000 son of Zoffany on Thursday emerged as the top lot in the penultimate session of the Goffs November Foal Sale. A good year on the track for Zoffany's first runners, who included Illuminate and Foundation, has ensured the Dansili stallion's progeny have been in demand this week and none more so than the Seskin Stud-consigned session-topper. Timmy Hyde tried hard to secure the relation to German Derby winner Lucky Speed and recent Australian Group 1 hero Magic Hurricane, but it was Jamie Railton who held sway when he brought the price to €150,000. "He's from a German family I know well," said Railton. "There's a bit going on in the family - Lucky Speed has been placed at Group 1 level again and you have Magic Hurricane there too. "He'll be back for sale next autumn and, in terms of sterling, I thought he'd make around that price." 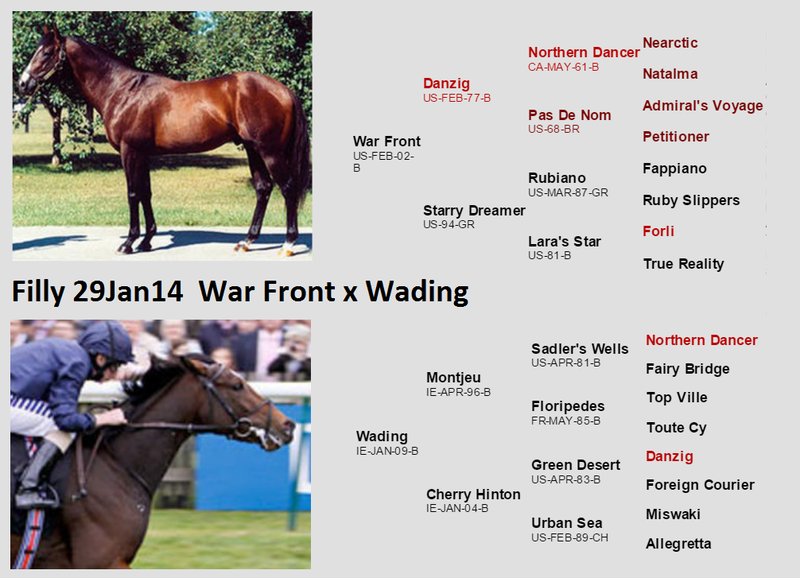 Official conformation photographs of WAR COMMAND, RULER OF THE WORLD , NO NAY NEVER, & AUSTRALIA From Coolmore. COOLMORE National Hunt sires accounted for nine of the ten most active stallions in Britain and Ireland this year according to figures published by Weatherbys in the Return of Mares. Busiest of all was five-time Group 1 winner Fame And Glory, who is recorded as having covered 346 mares at Coolmore's Grange Stud in County Cork. The son of Montjeu has his first yearlings on the ground. 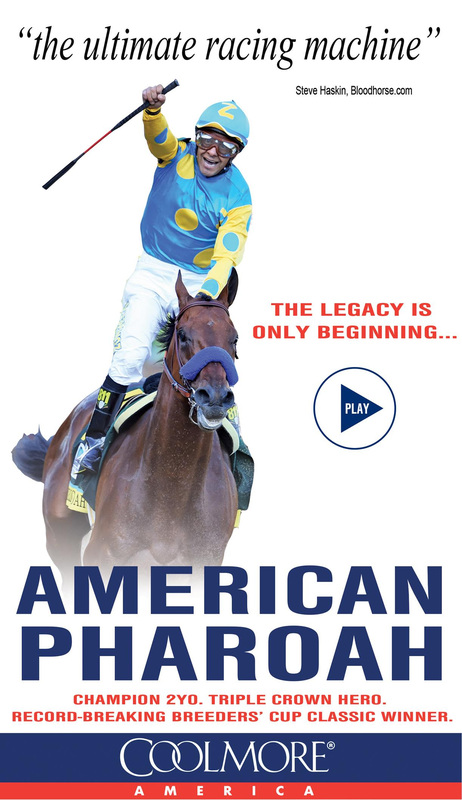 He received 234 and 263 mares in his first two years at stud. Leading Light - like Fame And Glory, an Ascot Gold Cup-winning son of Montjeu who stands at Grange Stud - was the second busiest stallion this year with a bumper 318 mares in his first book. Another newcomer to the Coolmore National Hunt roster, Ocovango, had the third biggest book with 315 mares sent to him at the Beeches Stud in County Waterford. Prix Greffuhle winner Ocovango is by Monsun, an increasingly popular influence in the jumps sphere, and so is the fourth busiest stallion of 2015 - dual German Group 1 scorer Getaway, with 303 covers. Another resident of Grange Stud, Getaway has his first three-year-olds on the ground. He topped this table last year, having covered 270 mares. Although the largest book size in 2014 was 270, no fewer than five stallions covered in excess of 300 mares this year. Four-time Ascot Gold Cup hero Yeats completes the quintet, with 301 served at Coolmore's Castlehyde Stud in County Cork. 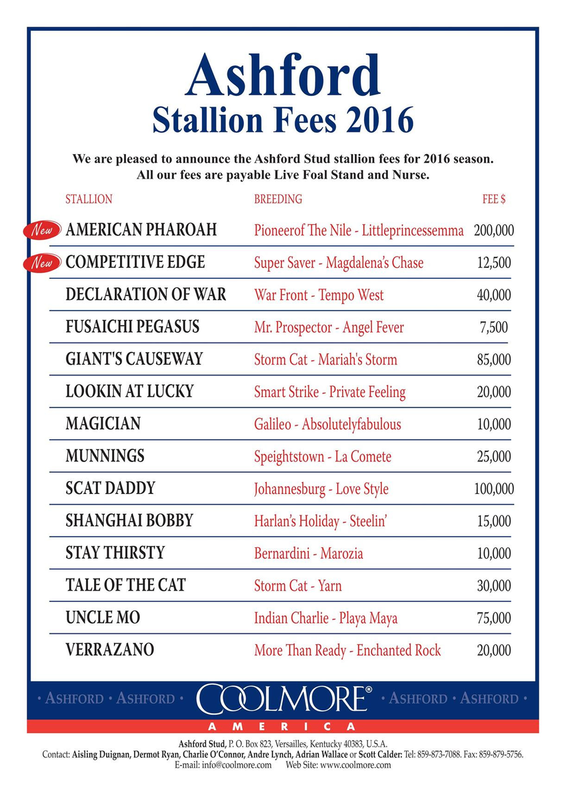 Sixth-placed Shirocco - another son of Monsun in the National Hunt ranks - is the only non-Coolmore stallion in the top ten. The four-time Group 1 winner, sire of Annie Power, covered 280 mares at Glenview Stud in County Cork. Shirocco is closely followed by two sons of Galileo, Imperial Monarchand Mahler, on 269 and 268 mares, and then two sons of Danehill,Dylan Thomas and Westerner, on 263 and 246. The most active Flat stallion this year was Kodiac, whose fee was more than doubled to €25,000 in the wake of a stellar 2014 in which he supplied champion two-year-old filly Tiggy Wiggy. The son of Danehill covered 232 mares at Tally-Ho Stud in County Westmeath, seven more than last year. Dark Angel also enjoyed a good year with his progeny in 2014 - they included dual Group 2-winning two-year-old Estidhkaar - and he was rewarded with a book of 225 mares this year. That was 72 more than in the preceding covering season. There was a real buzz about Zoffany's first yearlings at the end of last year; so much so, his fee was increased by two-thirds to €12,500 even before his first runners had graced the track. 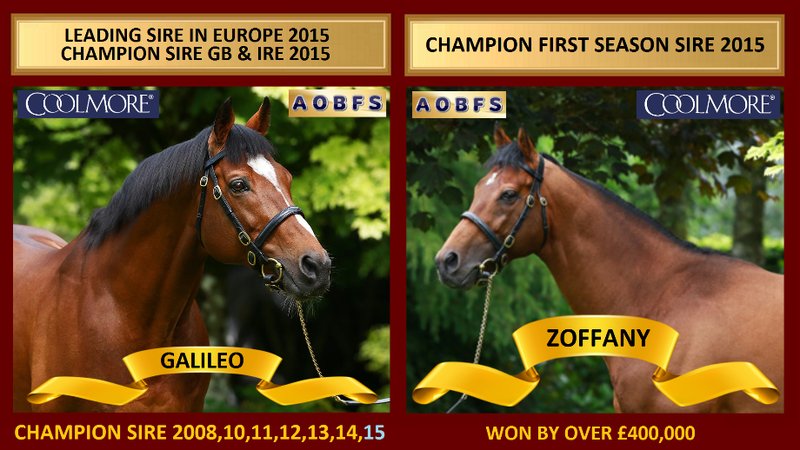 That did not deter breeders who sent Zoffany 220 mares, 90 more than in 2014, and their faith was soon justified when the stallion delivered three Royal Ascot winners in June. The busiest British-based stallion this year was Overbury Stud's excellent source of jumpers, Kayf Tara, with 200 covers. His merits were advertised in time for the 2015 breeding season by Grade 1 winners Lieutenant Colonel, Special Tiara and Thistlecrack. 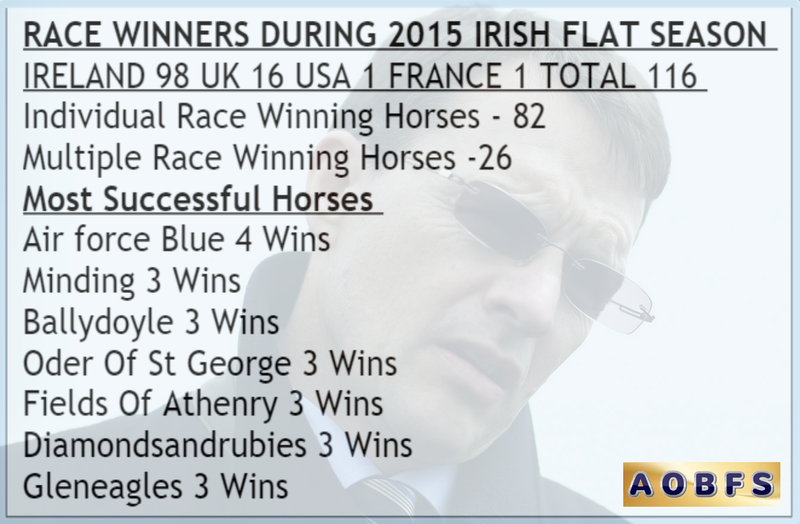 Future Stars of 2016 from Aidan O'Brien on Vimeo. Did not go through sales ring ? Dual G1-winning juvenile Minding (2f Galileo-Lillie Langtry, by Danehill Dancer) captured the Two-Year-Old Filly prize at the 2015 Cartier Awards in London on Tuesday night. A runaway winner of the G1 Fillies’ Mile at Newmarket, the daughter of Galileo also won the G1 Moyglare Stud Stakes at the Curragh in September. She heads into the winter as a warm favourite for both the 2016 1,000 Guineas and Oaks. The Award was collected by Paul Smith(pictured with Cartier chairman Arnaud Bamberger). Minding runs in the colours of Smith’s father Derrick. “This division was very tough with some fabulous fillies in the mix. Minding, by Galileo out of Lillie Langtry, was home-bred which makes this award extra special. 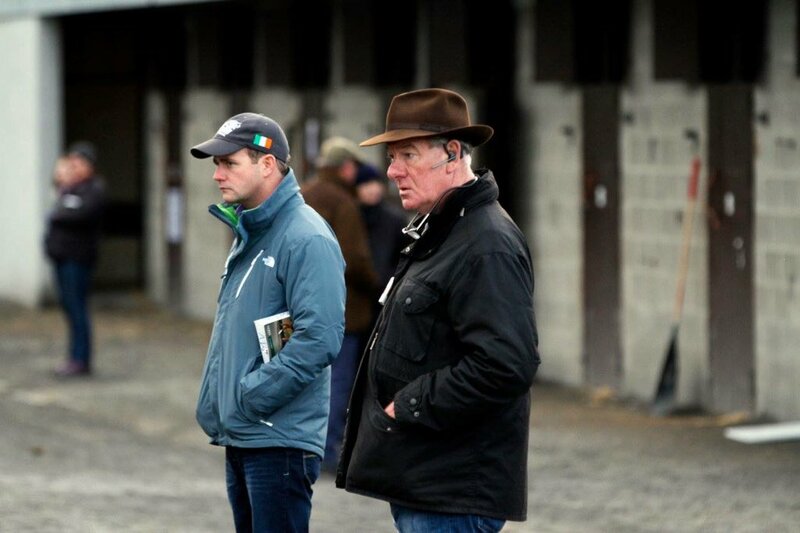 I would like to thank Paul Shanahan, MV Magnier and all the team at Coolmore. 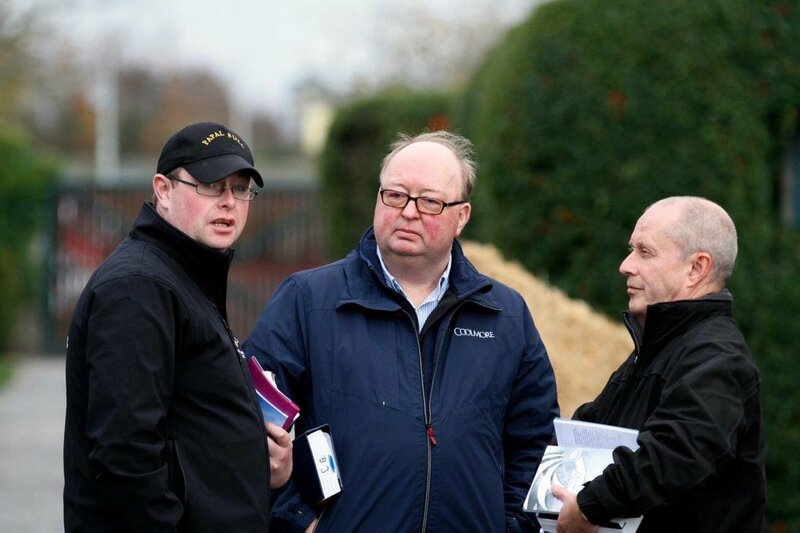 I’d like to thank Aidan and Joseph O’Brien, Seamie Heffernan, Colm O’Donoghue and all at Ballydoyle for getting this exceptional filly to the track,” said Smith. Smith also paid tribute to jockey Pat Eddery who had died earlier that day. all the winners are listed directly below. THIS season's triple Group 1-winning miler Gleneagles has had his fee pegged at €60,000 in his first season at Coolmore next year. The colt retires as the winner of seven races, including four at the highest level - the National Stakes, 2,000 Guineas, Irish 2,000 Guineas and St James's Palace Stakes. Gleneagles was also first past the post in the Prix Jean-Luc Lagardere at two but was demoted after being deemed to have caused interference. He has impeccable pedigree credentials, as a son of multiple champion sire Galileo - whose fee at Coolmore is listed as private for the ninth consecutive season in 2016 - and a brother to Irish 1,000 Guineas heroine Marvellous and Group 3-winning two-year-old Coolmore. 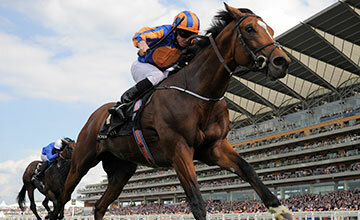 The dam, Cherry Hinton Stakes winner You'resothrilling, is a sister to iron horse and US champion sire Giant's Causeway. Dual Group 2 winner Ivawood and Classic hero Kingston Hill have been introduced to the Coolmore roster at €9,000 and €6,000. Zoffany is rewarded for a blinding first season with two-year-old runners - which included a Royal Ascot treble with Illuminate, Washington DC and Waterloo Bridge plus Royal Lodge Stakes winner Foundation - with a fee increase to €45,000 from €12,500. Fellow freshman sire Canford Cliffs - who leads his peers in terms of number of winners, with 30 - has had his fee increased to €17,500 from €12,500. Mastercraftsman, sire of 17 Group/Graded winners including this year's dual top-flight heroine Amazing Maria, has had his fee reduced to €35,000 - the equivalent of around £25,000 for British breeders - from €40,000. Rip Van Winkle and Henrythenavigator have both had their 2016 fees halved from this year and will stand at €12,500 and €7,500 respectively. Fees for Australia, who covered his first mares this year, and Camelot, whose debut crop are foals, are left unchanged at €50,000 and €25,000. Subfertile Starspangledbanner is set to return from Australia after having to miss the trip this year due to a bout of colic. He will cover at €15,000. As already reported, Fastnet Rock - sire of this year's Group 1 winners Diamondsandrubies, Fascinating Rock and Qualify - is also set to shuttle from Australia again. His fee is listed as private.